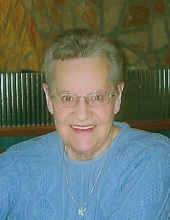 On Sunday, January 27 Mrs Norma Green passed away at the Lloydminster Continuing Care at the age of 89 years. Norma is loved and remembered by her daughter Patricia (Norman) Tatlow of Victoria; son-in-law Raymond Tatro of Lloydminster; grandchildren Melissa (Ryan) Wilson, Nicole Tatro (Justin Olynyk), Alicia (Adam) Creasy, Jessica Tatlow and Nadia Tatlow (James McCracken); great grandchildren Max Wilson, Abby and Ethan Creasy as well as numerous nieces and nephews. She was predeceased by her husband Harry Green, daughter Debra Tatro, her parents Norman and Jessie Mair, siblings Hugh Mair, Ina Coleman and Ralph Mair . "Email Address" would like to share the life celebration of Norma Jean Green. Click on the "link" to go to share a favorite memory or leave a condolence message for the family.